Heinz H. Volz, Chief Warrant Officer, born Nov. 2, 1917, Odem, TX. He served in the 36th Inf. Div. National Guard from 1934-37 before USN enlistment in May 1937. 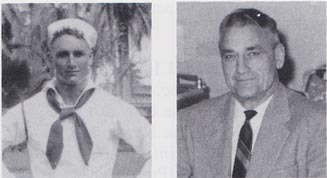 He served aboard the USS West Virginia from August 1937-May 1941 and was prominent in athletics (specializing in wrestling, rowing and weight lifting). Volz then served in the US Army Infantry from March 1942 until his retirement in August 1958. He served in most ranks from private through major before retiring as chief warrant officer, grade four. During his Army service he earned his B A and MA history degrees from the college of William and Mary. After leaving the Army he taught social science classes and held administrative positions at the Wharton, TX, Community College until retirement in 1983. He and his wife have two sons and five grandchildren. During his teaching career and afterwards, he and his wife, also a teacher, traveled extensively during the summers and visited most of the countries in the six inhabited continents.